You walk through the desert. You are thirsty. You walk along and what do you see? A paradise of colours. Do dreams come true? Yes, they do. 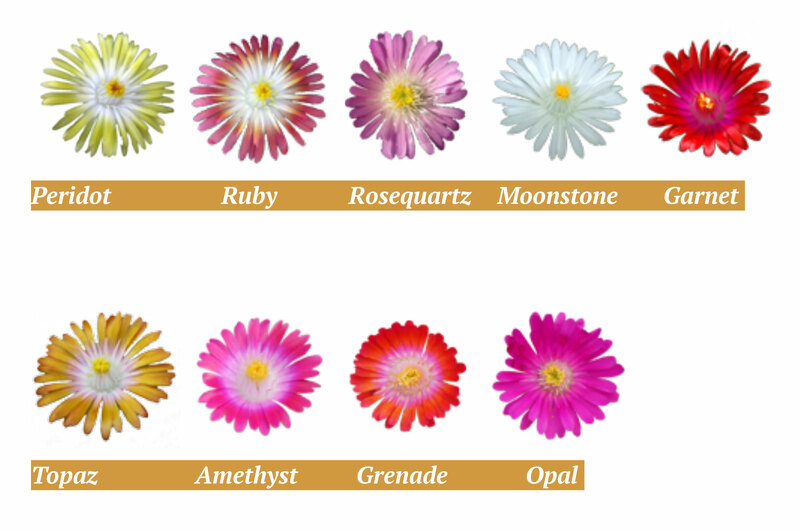 These new Jewel of Desert Delosperma’s (Ice plants) are now also available at your nearby garden center. Enjoy the nice colours. They hardly need any water. They like drought and full sun. These new Delosperma’s flower from May until the beginning of the winter as long as the sun shines. They don’t mind a cold winter. They aren’t called Ice plants for nothing. Delosperma’s have to be planted in full sun. The type of soil is less important as long as the soil is very well drained. Delosperma’s hate wet feet. Don’t spoil them too much. Remove dead flowers to stimulate new flowering. Delosperma’s are, of course, excellent in mixed containers, rock gardens, the perennial border and/or for green roofs.